Progress on Night Sky is coming along nicely! All the stars are done…welllllll, I have six seams left on the white/silver stars but the stars are basically done. Now I just have to add the sashing…frame….borders? Whatever the black pieces around the stars is called. That is my quilty goal for July. To get the sashing done around the stars, and hopefully get the top done! 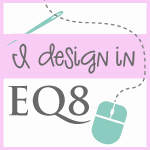 SEGUE Have you heard of One Monthly Goal by Elm Street Quilts? It’s a link up with the idea that you set a goal or goals for the month that uses fabric, thread and/or yarn, add your goal to the link up and then post again at the end of the month to share your accomplishment in the One Monthly Goal Finish Party. You can link up with a blog post, Instagram, or Flickr. As an added incentive, each month there will be a random drawing from those who joined both the finish link-up and the goal link-up to win a prize from the sponsors! You can find all the details and join the link up by clicking the link above. Previously I talked about starting my Jaybird journey with Gazebo. With that done, I’m on to Night Sky. Like Gazebo, this is much simpler than it looks. Night Sky uses the Sidekick ruler, which has a bunch of lines all over it as well. But once you understand how it works and use it, it’s so simple. (I feel like I’m repeating myself from the last post). The pattern includes sizes for crib to King which is really nifty because the stars are actually the same size but it’s the “frame” around the stars that change to make the different size quilts. Jaybird doesn’t do y seams so what’s also really nifty is the stars are half hexagons. To put the quilt together, you sew the columns not the rows. So different and cool, right? The Kona colours used in pattern are not listed in the pattern so I chose my own colour sets. And then I found the colours listed on Jaybird’s website… Oh well. I have the orange, green, and purple stars done, just one more colour left then I can start sewing it together. Although I think I’m going to redo the green ones because I find there isn’t enough contrast between Pistachio and Asparagus. Sometimes I have really great self control when it comes to impulse buying. Other times, not so much. A good example of this is when Olfa gave a sneak peek of the April Quilty Box. 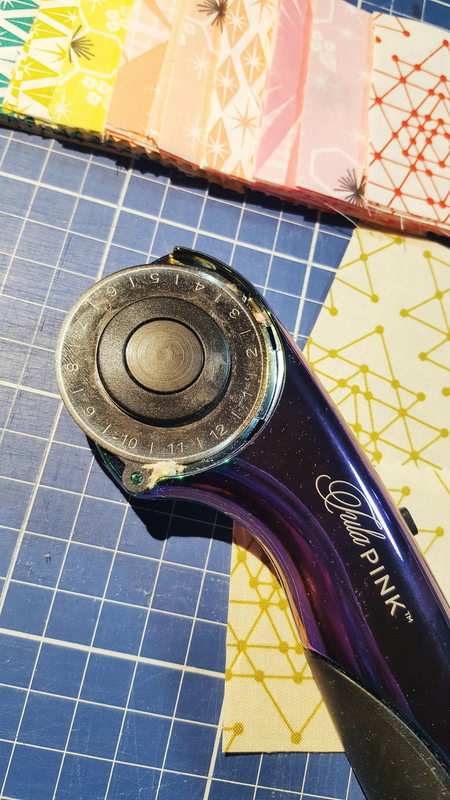 They announced that their new Pink Splash rotary cutter would be in the April Quilty Box and my self control went out the window. Instead of just waiting and buying one at a local quilt shop, I decided I’d try Quilty Box for a month and see what it’s all about. If you’ve never heard of Quilty Box before, it’s a monthly subscription box (the size of a shoe box) that has a retail value of over $60 USD. There is a monthly theme based on a featured artist’s style and contents include 4-5 Exciting Quilting Products like pre-cut fabric (from charm packs to half-yard bundles), thread, notions, or patterns. 5% of profits for multi-month subscriptions is donated to Quilts for Kids, and they offer free Shipping in USA – $10 Shipping to Canada, $20 to other countries. A Month-to-Month subscription costs $48 USD/month but you can also choose 3-, 6-, or 12-month prepay subscriptions. Quilty Box April 2018 included Foundation FQ bundle, Aurafil thread, Olfa Splash Rotary Cutter (not pictured), and Bundles of Inspiration booklet. So, I signed up for the Month-to-Month, used a $10 off coupon, and ended up paying around $63 CDN for one box. Yeah, that exchange rate is a killer. All because I wanted a pink rotary cutter. In addition to Olfa’s cutter, the box contained a FQ bundle of Foundation, Shayla Wolf of Sassafras Lane Designs’ debut fabric line, a spool of Aurafil thread, and the Bundles of Inspiration booklet that includes a pattern designed for the fabric. I do love the Foundation bundle (those colours!) – it’s fabric I would probably lust after but not purchase so I am very happy about receiving it. Is it worth $63 CDN? I’m not so sure. If I lived in the US, I would be subscribed without a doubt but honestly, I just can’t justify spending that much as a Canadian. Unfortunately. You can click here to find out more about Quilty Box and/or sign up if you want! I’ve officially started my quilt journey with Jaybird Quilts. And boy, it looks like I’m gonna journey pretty far. I’ve mentioned before that I received the Gravity kit at Christmas 2017 (very excited) but, in all honesty, it’s a pretty intimidating quilt. I know a few fabulous quilters who have made Gravity and they all say I will have no problem with it. I don’t doubt them but still….it’s a huge quilt that requires precision and special rules to make. I need to work my way up to it especially since I’d never used a Jaybird ruler before. So I started my journey with small steps – Gazebo. A 20″ x 23″ table topper. Quite a few things surprised me with this project. First, I didn’t buy any fabric (well, I went “shopping” in Momma Bear’s stash), and the only solid is the grey! Shocking right? Second (more importantly), this pattern uses the Hex N More ruler which is so. simple. to. use. Oh. My. Lanta. The ruler looks very complicated with lines everywhere but once you start using it, it becomes very clear and simple. Every piece just fits together beautifully. There are no y seams (to be honest, I’m not really sure what a “y seam” is but I don’t hear very good things about them). I loved how this came together and it only took an afternoon to complete the top – from cutting to the last seam. Now I’ve handed it off to Momma Bear for some ruler quilting. I’ll most likely post a picture on my instagram when it’s completely finished. Variety is the spice of life. That’s what they say. Clearly, that’s why I have 5 rotary cutters. Also, because they are just so pretty. Olfa Breast Cancer, Fiskars, Olfa Splash, Minc LED cutter, Tula Pink. The Tula Pink cutter sells for $89.99 CDN (plus tax) which, let’s be honest, is absolutely ridiculous. I don’t know anyone who has bought one. I ‘won’ mine through a silent auction at a quilting retreat for much less than $90. I assume the hefty price tag is because it’s made of aluminum alloy. And has a fancy paint job. The curved handle design allows for even pressure which makes for clean cuts, works with both Left and Right Handed configurations, and has a very nice secure locking blade guard for safe usage and storage. I was at three retreats in April and did plenty of cutting with this rotary cutter. It is my favourite at the moment because of how it feels in my hand. And it looks so pretty! If it were around the $30-40 range, I would definitely be telling everyone to get one. For $90 would I recommend this? Unfortunately no – unless money isn’t an issue for you. Because I’m a nerd, I decided I wanted a Star Trek quilt. I had seen a quilt on Esty made up of HST (think Postcard from Sweden but with red, blue, gold, and black). I liked the look of the random placement of the HST but I wanted something more….nerdy. So I designed this quilt. It was the second quilt I designed (this is an important piece of information). I started quilting in July 2016, the same month I designed this quilt. Being a new quilter, a 5″ HST didn’t seem that big. Let me tell you, when you put 304 of them together, it’s big. This quilt is approximately 80″ x 95″. Needless to say, I now know 5″ HST are big enough. I experienced plenty of thread breakage while doing the first few rows and the last few rows. And the tension changed on it’s own part way through. 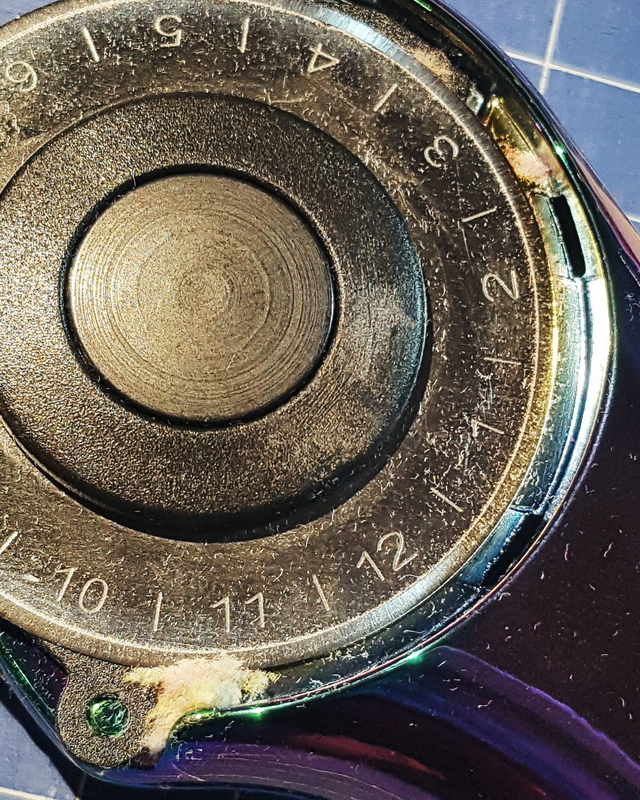 I’m not sure why any of the problems I had occurred although, I’m inclined to believe the first “set” of thread breakage was due to the bobbin not being wound correctly. Besides that, I’m at a loss for why it happened which made things increasingly more frustrating for a while (thanks Momma Bear for making me continue on). I started this quilt in October 2016, finished the top in 2017, took months to find the perfect backing (which I did from FabricUtopia on Etsy), and it took months for me to figure out how I wanted to quilt it and what thread to use. My goal was to have it done by the end of 2017 but I got it finished in the beginning of 2018, which is close enough. Protip: When it says read the full pattern before starting, read the full pattern before starting. Twisted Ribbon pattern by Katie Rock. Twisted Ribbons is a pattern by Katie Rock that was in an issue of Quilty. It’s just flying geese, half square triangles (yay), and rectangle blocks. I was going to make it scrappy…well, scrappy to the best of my ability. It’s a fairly simple pattern so I figured I could make it without consulting my wise Momma Bear. Well. That was a mistake. I’d never done flying geese. I knew how to make them but had never actually made one. The pattern in the magazine gives instructions on how to make individual flying geese. One. At. A. Time. 108 of them. I soon learned this was not the best use of my time…”soon” being after I had cut all the individual pieces already. Had I consulted Momma Bear before starting she would have passed down the knowledge of 1) the flying geese ruler, and 2) how to make multiple geese at a time. Knowledge that I now know and wish I knew back then. Amended Protip: When it says read the full pattern before starting, read the full pattern before starting because there may be a different/more efficient way to make it. Enter your email address to follow girl×fabric and receive notifications of new posts by email. Please feel free to share as long as you provide credit to Amanda Vajda of girl×fabric and link back to the original. Please do not change in any way or use commercially without written consent from me.